One of the hardest things about being a productive writer is maintaining discipline. If you want to create a successful blog, or write book after book, the surest way to work is to make a daily time or production commitment. Some choose a set amount of words. I’ve read that Leonard Cohen set himself a goal of three pages a day. I tend to think in hours: I finished my books Kiss Me, Genius Boy and My Generation’s Lament by spending my hour-long lunchbreak in a cafe, five days a week, over a period of a few years, writing in Moleskine notebooks with a fountain pen. I chose to write on paper because it removed distraction. Just last night, a friend of mine who blogs and has on occasion written long stories was talking about how she finds that being on a computer and having the internet available is a constant temptation to not write. Now, writing on paper is a great way to avoid the internet. My friend and I have talked about this before. But it’s usually slower than typing, not least because in the end you have to copy your notes out. This article, being written in iAWriter. I like to keep things simple, so here’s the one app I personally do or would use on each platform for distraction-free writing. There are alternatives, and I’ve tried almost all of them—but after long use and consideration these are the ones I recommend. Among the reasons I recommend the above apps is that they support Markdown, a very simple and human-readable method for putting structure and formatting in plain-text documents. The link there is to the Wikipedia article on the Markdown syntax, which actually tells you almost everything you need to know to get started using it. It has the best change-tracking tools for editors of any software I’ve used. Almost anyone will accept a Word document—particularly in business and academia. Its many features, and the ability to add arbitrary styling to text, are confusing and distracting. Most users don’t know how to use Word well (which means making rigorous use of heading and paragraph styles), and end up creating ugly documents with poor structure and inconsistent formatting. With Markdown, as with some other systems (like LaTeX and its graphical front-end, LyX) that separate content and presentation, you make a heading by adding some simple markup. In Markdown’s case, you put some hashes before your text—# for heading 1, ## for heading 2, and so on. Put text between asterisks for italic, two asterisks for bold. You can do bullets, blockquotes, footnotes, links, and more just by typing a couple of symbols on your keyboard. The file you create can be read on any computer, using any plain-text editor—the kind of software you can always get for free. Markdown editors almost always give you the ability to export to HTML (some of the cleanest HTML you’ll ever see in your life), which is great for blogs and other websites, and RTF to open in Word if you need to. If you want to get really technical, you can even use the command-line tool pandoc to convert Markdown to formats including RTF; DOC; ePub; and PDF files for print, nicely typeset using LaTeX. There’s also a Markdown variant called Fountain that you can use for writing screenplays and is compatible with Final Draft. Markdown is the perfect way to put formatting in your writing, especially if you’re using a distraction-free writing app like the ones I mentioned above. These days, I use Markdown files as the base for most of my blog posts (including this one), and all of my book manuscripts. It helps me get my work done faster and better—and it can help you, too. 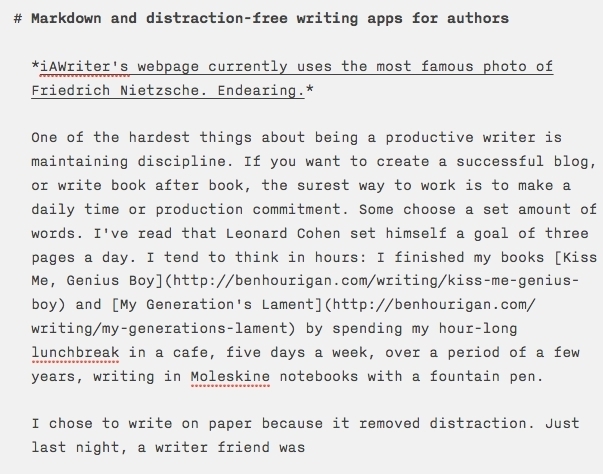 Want to see what I’ve managed to write using Markdown and distraction-free tools? Check out Kiss Me, my first novel, FREE on iBooks, Google Play, and a range of other platforms, or just $5.99 for Kindle. It’s the first volume of a 250,000-word trilogy that ends with My Generation’s Lament (out now) and Seize the Girl (due Dec. 2015). 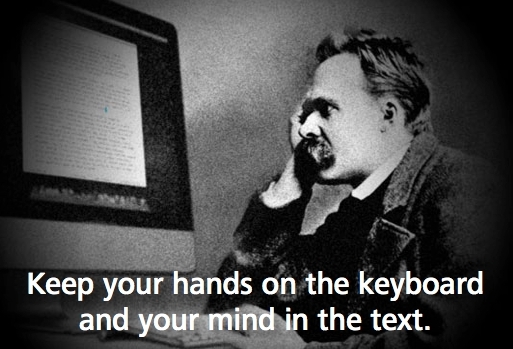 Markdown can really help you get your work done. Previous Previous post: Why the old posts?